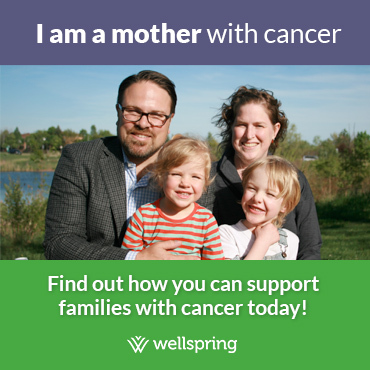 Regardless of where you are in your cancer journey, Wellspring will help you select programs that are appropriate for you now, and for each step ahead. Wellspring’s more than 40 different programs and services are designed to meet your specific needs. Some are designed to help when you’re not feeling well, or if you are dealing with difficult symptoms. Others are intended to help with cancer recovery and restoring your health and wellness. And there are many programs that provide you with the tools, resources and knowledge needed to help you make a transition back into the community and manage your own health on a long-term basis. Drop-In Programs: These programs require no ongoing commitment and are especially helpful for those who are not feeling well, are in treatment or are coping with symptoms that make commitment difficult. Registration or Appointment Required: These programs require a commitment to attend all sessions. You will also note that programs are available for both patients and caregivers, for patients only, and for caregivers only. of peers to talk about your circumstances and concerns in a shared way, and in a caring setting. You might think about joining a support program if you are feeling isolated, want a safe place to acknowledge difficult emotions, or want to meet others and learn how they are dealing with all of the challenges of a cancer diagnosis. You might think about joining a coping skills program if you are feeling anxious, tense, stressed or are having trouble sleeping. You might think about joining an Expressive Arts program if you enjoy creative expression, and want to explore and gain insights into how cancer has impacted your life. Cancer has a cost, especially for patients who have to take a leave of absence from work for treatment and recovery. Money Matters is a program that helps individuals navigate the complex maze of income replacement and drug compensation programs. In addition, it provides access to various professionals through specialized Money Matters “clinics”. Money Matters is available on a by-appointment basis. You might think about the Money Matters program if you have taken a leave of absence from work, have drug costs not covered by OHIP, or require financial advisement. Please note: Money Matters and its clinics are focused on the financial circumstances of patients whose income or finances have been affected by cancer. Caregivers are welcome to attend with, or on behalf of, the patient for whom financial needs are being addressed. Most cancer patients who are working at the time of diagnosis take a leave of absence for some of their cancer journey. Whether still planning on a workplace return, or after the return has happened, Wellspring has programs to help patients achieve a successful and sustained work experience after cancer. You might think about Wellspring’s Cancer and the Workplace programs if you are concerned about the impact of cancer on your career choices, your ability or desire to do your job, or if you may require accommodation in the workplace. Nutrition is important at any stage of the cancer journey. Wellspring’s Nourish program provides many different sessions on cancer and nutrition using the latest research to teach the fundamentals of good nutritional practices for cancer patients and, in many instances, includes cooking demonstrations, food sampling and take home recipes. You might think about a Nourish program if you are experiencing side-effects of treatment that make eating difficult, have trouble managing weight gain or weight loss, or want to know more about how healthy eating can aid in cancer recovery and reduce the risk of cancer coming back. Health restoring programs have a rehab focus. They aim to help patients restore their health and recover from the various physical, cognitive (thinking) or lifestyle impacts of cancer. You might think about a health restoring program if you are experiencing fatigue, physical and/or mobility limitations, “brain fog”, or want to improve lifestyle choices to achieve wellness and reduce the risk of cancer coming back. A diagnosis of cancer can create special concerns and needs for parents of young children. Wellspring offers special family-focused programs that provide support, information and coping skills to young children and their parents. You might think about a program for parents and children if you have questions about how best to support your children, wish to learn about age-appropriate communication and coping strategies, or want to connect with other parents who are dealing with a cancer diagnosis. Parent’s Meet and Greet A support and networking program for parents of children with cancer. W.O.W. Program (Wellness on the Water) A 2-hour sailing excursion for the whole family on Lake Erie. for children with cancer, their parents and siblings. Each phase of the cancer journey brings a different set of questions. Wellspring’s information programs provide credible, expert-led answers. You might think about an information program if you have information needs pertaining to any aspect of your cancer experience. At some Wellspring centres, child minding and transportation services are offered to support people in coming to Wellspring and participating in programs. You might think about Wellspring’s child minding and transportation services if you require either one to participate in a program.